What makes California such a tremendous force in American and World wine, is the same reason that makes California tremendous force economically, creatively, and physically. California has it all. I don’t mean this in an arrogant way: California is paradise! But then again, I do kind of mean it that way. But California does have it all. To be fair, California is much larger (and longer…a very important geographical advantage to our agriculture and wine), than most other states of the Union. However, what it contains within its large borders is what is most important. From the lowest to highest points in the lower 48 States, to the largest trees, celebrities, and budget deficits, California does everything on a large scale. There are many more clichés to add here about our Governor, etcetera, etcetera, but you get the point. Aside from the general imagery everyone conjures up of palm tree lined beaches and very public celebrity meltdowns, California remains a naturalist’s dreamland. There is a reason much of the modern day environmental movement first started with California: it is a glorious place. 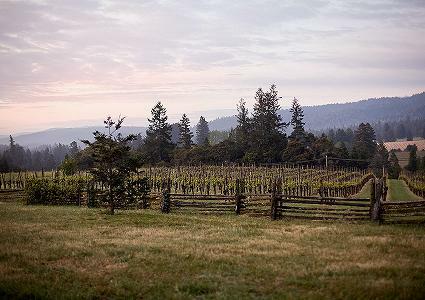 The diversity of snow-capped peaks, boiling desserts, vast valleys, and jagged coastline is what give California wine such tremendous range and potential. Often you hear comparisons between California and France’s wine regions (Central Coast and Rhône, Napa and Bordeaux). If there is an award-wining region of France, California has an AVA that mimics its ancient European predecessors. A winemaker in my area referred to the Santa Ynez Valley and surrounding regions as “God’s Country”, and he is right to say so. However, these divine landscapes are duplicated all over the state. Mendocino County with its rugged and dramatic coastline is no exception. Milla Handley has been owner/wine maker of Handley Cellars, which operates in the Anderson Valley of Mendocino County, a cool climate region known for it’s Pinot Nior, since the earl y 80’s. Her résumé of associates and experience is impressive. But in many ways, her career in wine was a unique choice for Milla, one that reflects her independent do-it yourself spirit. Wine making was not necessarily the obvious career path for Milla. None-the-less, wine chose Milla just as much as she chose wine. Milla’s father made a good living for his family in commercial real-estate in the Silicone Valley. Even though the family had a history of alcohol production (Milla’s Great-Great-Grandfather was Henry Weinhard the legendary Oregon brewer), her early passions were for the arts and animals. So how did Milla end up in a rather remote valley in Northern California making wine? I asked Milla how she got into wine, why she likes it, and who has inspired her along the way. You had any number of opportunities open to you as a young woman. Why wine? The wine industry as whole is male heavy. While you and Co-wine maker Kristen Barnhisel have been pioneers in more than one way, do you feel there has been any special challenges you have had to confront as female wine makes? Or is making wine a tough job no matter who you are? As a hands-on manager and wine maker, is there one aspect of wine making you most enjoy? You started with sparkling wines in your basement. Is there a varietal you enjoy working with most of all today, and if so why? Who has inspired you in California wine? 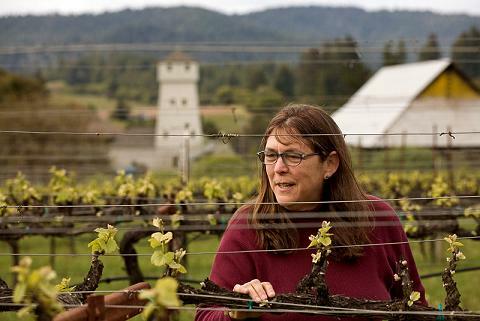 At present, Milla oversees the production of 12,000 – 13,000 cases anually, producing varietals such as: Pinot Nior, Zinfandel, Syrah, Sauvignon Blanc, Chardonnay, Gewürztraminer, Pinot Gris, Reisling, Vionier, and Brut. Milla tends to her vineyard in Anderson Valley. Jean Deitz Sexton (Wines & Vines) – Milla Handley: Anderson Valley individualist. Does the California Tourism Board know how hard you’re working on their behalf? Its good to be reminded how lucky we are to live here. Whenever I remember the time I spent up at Handley I always come back to what a nice group of people work there and the high regard they express for Milla. Great wine and great people = double good times. Maybe I should remind them 🙂 I could use some stimulous money to promote Californian wine for sure! Milla was great to work with. And everything I have read tells me her staff has a very high regard for her.